Recent news headlines have suggested that raw feeding dogs and cats could be bad for their health, and yours. The concerns surround contamination of raw meat pet food with bacteria which can cause gastroenteritis in humans, and in animals. Any raw meat can be contaminated with bacteria including salmonella and e.coli. Every year people become ill from eating undercooked meat, especially during barbecue season, and we are constantly reminded to ensure high risk meats such as chicken and mince are thoroughly cooked, that separate utensils are used for raw and cooked meats, and that we wash our hands well after handling raw meat. So, what’s different about raw dog and cat foods? Not much really…except that we feed the meat raw! Major raw food suppliers claim that they tolerate a lower bacterial count in their foods than would be tolerated in meat for human consumption as their food is not going to be cooked. Bacterial contamination levels may be unknown in meat direct from slaughterhouses, butchers, or game dealers. Dogs fed salmonella contaminated food don’t necessarily become ill. That fast gastric transit time in dogs may account for their ability to eat meat that would make humans ill. However, dogs fed raw meat contaminated with salmonella will shed higher numbers of the organism into the environment. This has implications for human health as salmonella can cause very serious symptoms, even death in those with compromised immune systems. Other risks associated with raw feeding include obstruction of the gastrointestinal tract by chunks of bone, and fractured teeth from chewing on bones. Does this mean you shouldn’t raw feed? Despite numerous studies showing that raw fed dogs shed higher levels of potentially pathogenic bacteria than kibble fed dogs, cases of gastrointestinal disease in raw fed dogs and their owners does not appear higher than those in kibble fed dogs in my practice. In fact most of the GE cases I treat are fed dry or canned dog food ( I always ask! )…but their owners do often admit that their pets will scavenge dead creatures, and discarded food on walks. Added to this, there have been several cases of dry dog food recalls due to salmonella contamination, and dried treats such as pig’s ear may also be contaminated. 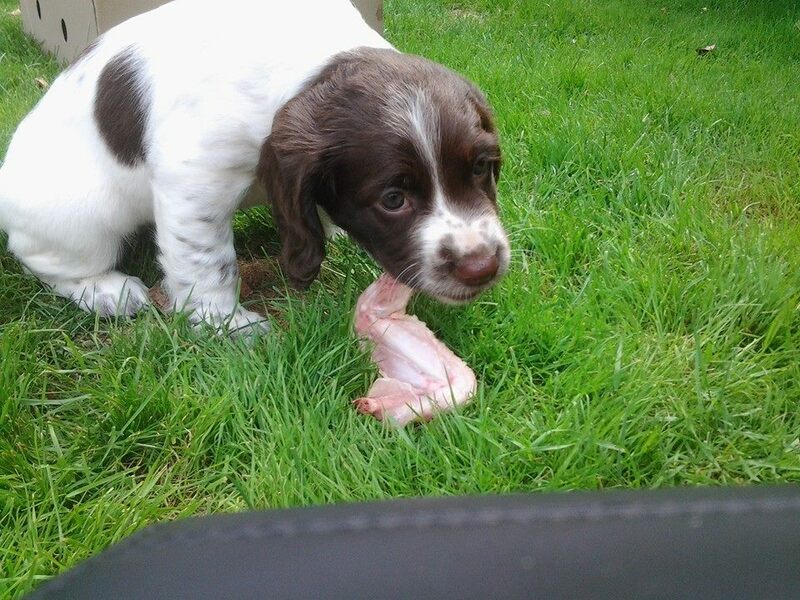 Raw bones are softer than the cooked bones and antlers which are sold as dog chews. Dental fractures and gastrointestinal obstructions are a genuine risk when feeding raw bones to dogs. However, cooked bones, antler chews, and hard nylon chews can also fracture teeth; I have yet to remove a raw bone intestinal foreign body, but have removed numerous chewed and swallowed dog toys and stones. I have treated a raw fed dog who needed surgery to remove bone from his oesophagus, but colleagues have treated more dogs which have swallowed large chunks of rawhide or pig’s ear. The risks of tooth fracture and obstructions can be minimised by feeding appropriate size and type bones, or by feeding only ground bone. Vets who support raw feeding have always advised that certain dogs in certain families may not be suitable for raw feeding, and that excellent hygiene is required in any family with a pet dog. Families with members who are immunocompromised should avoid raw feeding due to the increased handling of raw meat, and potential higher contamination of the home with potentially pathogenic bacteria. If raw feeding in a home with young children care should be taken to protect children through good hygiene, for example; handwashing, separate food preparation utensils for pets, and avoiding licking by pets. Immunocompromised pets may not be suitable candidates for a raw diet. This would include dogs receiving high dose steroids, chemotherapy, or recovering from certain illnesses. Where a raw fed pet’s circumstances change, but owners want to continue feeding a high meat ‘natural’ diet, what are the options? Firstly, consider switching from home-made raw to a commercial complete raw food. These are tested to ensure low bacterial contamination, as well as being nutritionally balanced, and requiring less handling. If that is considered too high risk, look for lightly cooked high meat foods, often sold in tray or pouches. Finally, there are increasing dry food options, both extruded kibble, and baked which are made with over 60% meat. If you are concerned about your dog or cat’s raw diet, and want advice on how to feed raw safely, consult a vet who understands and supports raw feeding. Copyright © Holisticvetsussex 2019. All Rights Reserved.